Settlements have existed in present day Greek territory since the Paleolithic times; settlements such as the Neolithic culture in Thessaly (3500-2800 BC), an early peasant culture with livestock and cereal crops, or the Dimini culture (from 2800 BC). The beginning of the Bronze Age marks the transition to the Metal Age and covers the period of 3100-3000 BC. Until 1100 BC. As a rule, a distinction is made in early bronze age, to 2000 BC, middle bronze age, to 1700 BC and a later period until 1100 BC. The transition to the Bronze Age occurs in Crete with the birth of the Minoan culture. Starting in 2500 BC, the first European high culture rises. Among the most important testimonies of Minoan culture are the palaces of Knossos and Phaistos. The Minoan languages, ​​spoken not only in Crete but also in other Aegean islands, are formally part of the ancient Mediterranean languages, more specifically the Aegean languages. In the period from the 17th to the 11th century BC the Mycenaean period is set. The Mycenaean culture is the Greek mainland culture in the late Bronze Age and is considered the first high culture of the European mainland. Palace centers such as Mycenae, Thebes or Nestor's Palace at Pylos, provide important testimonies of the Mycenaean culture. The reasons that led to the destruction of many Mycenaean centers shortly after 1200 BC and the fleeing of large parts of the population are still controversial issues and the subject of controversial discussions. The following centuries (1200 BC to about 750 BC) are referred to as the “dark centuries” or “the dark age of Greece”, because this period is little explored or none at all, due to the absence of written sources and very few archaeological finds. During this period, the transition to the Iron Age takes place. On 750 BC the Archaic Period begins, the first period of antiquity. It should be noted that in the 10th and 9th centuries, the Greeks adopted the Phoenician script, but extended it with the insertion of the vowel sign. Writing was disseminated by colonists and traders throughout the Mediterranean. 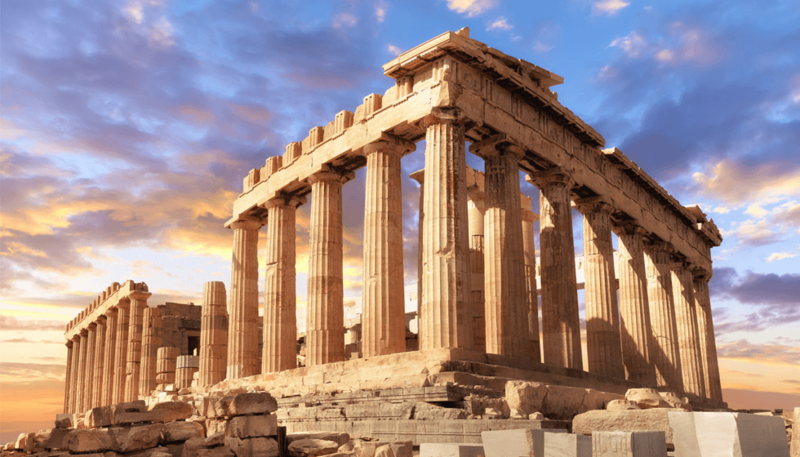 Ancient Greece is divided into the archaic, the classical and the Hellenistic periods. We should not ignore an important part of Greek history: the Greek mythology, which enchanted the whole world with its gods and demigods and their countless stories and legends. The archaic period (about 800-500 BC) is characterized by the great colonization of Greeks in the Mediterranean. This emigration during the first phase of colonization (850-750 BC) can mainly be attributed to the internal conditions of the Greek motherland. On the one hand, there is the search for new land, in an effort to solve demographic problems (overpopulation) as testified by certain ancient authors, including Hesiod. In addition to overpopulation, profound social contradictions caused by internal conflicts in cities such as Megara, Corinth or Athens, caused thousands to leave their homes towards the direction of Sicily and southern Italy. During the second phase (700-500 BC), settlers from Greece came from the mainland, from the islands and from Asia Minor, pursuing purely commercial interests and expanding around the coast of the Pyrenees Peninsula, the Black Sea and North Africa. The pursuit of new farmland was associated with trade policy considerations, and in particular with the safeguarding of trade routes. The Greek colonization extended over the entire Mediterranean. The main form of government in Greece became the city state (in Greek: Polis), with the exception of some parts of northern Greece and the Peloponnese. Monarchy continued losing ground, and oligarchic forms of government gained influence in city-states. However, tyranny was also applied as a form of government during the 7th and 6th centuries BC, spreading first in Corinth and subsequently in Sikyon, Samos and Athens. Under tyranny, a tyrant is granted unrestricted autocracy, lacking any legal basis and using power politics. In 550 BC, the Peloponnesian League was established in Sparta, with the latter strengthening its claim to power. The Greek Classic Period (500 to 336 BC) begins with the Ionian uprising (about 500-494 BC) and the resulting conflict between Greece and the Persian Empire. Athens defeated the Persians at the Battle of Marathon (490 BC), the Hellenic League defeated Athens, and Sparta defeated the Persians after the Battle of Thermopylae and the Battle of Salamis (480 BC). Against this background, Athens founded the Attic Federation in 478/477 BC. The struggle for supremacy in Greece culminated during the Peloponnesian War between Sparta and Athens, in which Athens lost to Sparta (404 BC). But Sparta could not maintain its supremacy long and was defeated at the Battle of Leuktra in 371 BC by Theban commander Epaminondas. After a brief period of Theban hegemony (up to approximately 362 BC), Philip II of Macedonia was murdered. His country became a hegemonic power in Greece. Attic democracy developed over two centuries: after the monarchy was abolished, an oligarchic form of government emerged. Various reforms by Solon and Cleisthenes paved the way and eventually led to the emergence of Attic democracy. During the period of Hellenism (336-146 BCE), Alexander of Macedonia continued the policies of his father, Philip II. Alexander not only managed to push back the Persians, but he built a great empire that reached as far as India and encompassed Egypt, the Middle East, Asia Minor, and northern India. The spread of the Greek language and culture in this great empire is called Hellenism. With the death of Alexander the Great in 323 BC, the empire was split into three great empires: the kingdom of the Ptolemies in Egypt, the Seleucids in Syria and the Antigonids in Macedonia. In addition to these large empires, many independent city states continued to exist. Against this backdrop, many Greek city states joined forces to fight against other city states and against Macedonia. Finally, the Roman Empire intervened against Philip V and defeated Macedonia during the Second Macedonian-Roman War (200-197 BC). After the defeat at the battle of Pydna Roman province, the rest of Greece became incorporated into the Roman Empire as Achaia Province. This marked the end of politically independent Greece for nearly two millennia. Greek culture did not lose its significance during Roman rule and it exercised its influence upon Roman civilization. Roman emperor Constantine the Great moved in 330 AD, the capital of the Roman Empire from Rome to Constantinople. During the same period, Greece’s Christianization took place until 400. The term Hellene became uncommon, as it meant non-Christians; The Greeks now understood themselves as Romans (Rhomeans). When the de facto division of the Roman Empire took place in 395, Greece was included in the Eastern Roman Empire as the diocese of Makedonia. The end of antiquity was marked by the invasion and settlement of Slavic groups in the Eastern Roman provinces since approximately 580. The Byzantine Empire developed from the Eastern Roman Empire, in which Christianity became the state religion and Roman-Greek traditions were cultivated. Byzantium had to defend itself in the following centuries against Slavs, Bulgarians, Arabs, Venetians and Normans, gradually losing national territory and expanding in the 11th century at the present territory of Greece and Asia Minor. Asia Minor fell to the Seljuk Turks in the 11th century and to the Ottomans in the 14th century. Gradually, the Ottomans conquered more and more parts of Byzantium, and it was finally conquered by the Ottomans, with the fall of Constantinople in 1453. For almost 400 years the Greeks were under Ottoman rule, but they were able to preserve their language, religion and identity. Under the influence of the Enlightenment, but also affected by the ideas of the French Revolution, a movement for the liberation of Greece from the Ottomans began in the beginning of the 19th century. This movement was supported domestically by Greek merchants and the Greek Orthodox Church and by foreign Greeks, the great powers and personalities such as Lord Byron abroad. The uprising against the Ottomans began on March 25, 1821 and lasted eight years. Athens was inaugurated on April 7, 1821, and in December of the same year a 67-member National Assembly met in Epidaurus to proclaim a provisional constitution and independence in January 1822 and to establish a government. Military and political struggles of the following years brought the intervention of Britain, Russia and France and the victory over the Ottoman fleet at the naval battle at Navarino (1827) caused a decisive turn. In 1830, the independence of Greece was established in the London Protocol as a hereditary monarchy state. The first king of Greece was Wittelsbach Prince Otto in 1833. The abolition of the parliament and his autocratic style of government earned him little sympathy among the population. Otto I had to abdicate in 1862, followed by the Danish Prince William as King George I in the throne. In 1864, the new king introduced parliamentary monarchy. This was followed by wars between the European powers and the Ottoman Empire. The state territory, which until then only included the Peloponnese, was expanded to the Ionian Islands (1864), Thessaly (1881), large parts of Central Greece and Crete. In April 1896 the first modern Olympic Games were held in Athens. The Greater Greek idea, regarding the incorporation of all Greek-inhabited areas (including Thrace, Constantinople, Cyprus, etc.) into the Greek territory, constituted the essential basis of Greek foreign policy from the late 19th to the early 20th century. Prime Minister Eleftherios Venizelos, a major supporter of the "Great Idea" extended the Greek territory during the Balkan wars of 1912-1913. The entry into the First World War in 1917 and the victory of the Entente also acquired the northern part of Epirus, the islands Imbros and Tenedos and Western Thrace (including Adrianople, today’s Edirne) and the then predominantly Greek-speaking regions of the Western Asia Minor, through the Treaty of Sèvres. But the attempt, with the approval of the victorious powers (League of Nations Mandate), 1919 and the Turkish defeat in favor of Greece, ended in 1922 in the so-called Asia Minor catastrophe. The 1923 Treaty of Lausanne established that Imbros, Tenedos, Izmir and Eastern Thrace were returned to Turkey and Northern Epirus to Albania. This was accompanied by a population exchange. Around one and a half million Greek and Armenian refugees had to leave Asia Minor, and in return some 400,000 Muslims left Greece. The Dodecanese Islands were returned to Greece after the Second World War in 1947. After the Asia Minor catastrophe, a deep rift was caused in Greek society, splitting the population into monarchy and democracy advocates. In the midst of these disturbances, General Ioannis Metaxas was appointed as head of government and foreign affairs minister to King George II. In the course of domestic political unrest and the bloody suppression of a strike, Ioannis Metaxas used a coup d'etat to build his authoritarian "regime of August 4", which remained in force until 1941. During World War II, German and Italian troops invaded Greece and occupied it (1941). This coincided with the formation of an exile government in London and resistance movements forming in the country, some nationalist and others communist. In the aftermath of the war that raged in Greece (03/1946 to 10/1949), came the continuation of the existing conflict since 1943 between the left, the Greek Popular Front, and the right, the Greek conservatives and monarchists. The civil war was initiated with the intervention of British and American troops in 1949 in favor of the monarchy. The new constitution of 1952 established constitutional monarchy in Greece. In terms of foreign policy, integration into the Western Alliance was sought, in the form of joining NATO, becoming an EEC member or joining the European Union in 1981. From the 1950s onwards, an economic upturn can be observed, but the situation is relatively stable domestically. As a result of the domestic political crisis in the mid-1960s, a military coup under Georgios Papadopoulos, who deposed the king, proclaimed the presidential republic and Papadopoulos became the first prime minister. Konstantinos Karamanlis returned from exile and took over the government power on 23.7.1974, introducing a new constitution after a peaceful transition. The monarchy was finally replaced by the third democracy. Since the transition to democracy, the political stage in Greece was dominated by two parties until January 2015: Nea Dimokratia (New Democracy) and PASOK (Panhellenic Socialist Party). In 2001, Greece joined the Economic and Monetary Union, and in 2002, the Euro was also introduced in Greece. In 2004, the 28th Summer Olympics were hosted in Athens. At least since 2010, Greece has been fighting against the debt, financial and economic crisis. Since 2017, the Greek economy seems to be back on track for growth. Greek mythology usually refers to ancient Greek myths that entwine themselves with the gods and heroes of ancient Greece. Greek mythology is considered one of the richest mythologies in the world. It has had a significant influence on the "culture of the West", on philosophy, history, politics, fine arts and literature, and is considered an essential element of Western cultural heritage. Ancient Greek myths have been the subject of almost every literature genre. During the classical period they were included in epic and choral poetry and tragedy, whilst during the Hellenistic period they were also part of collections. Among the oldest surviving sources are Homer's epics (9th / 8th century BC), the Iliad and the Odyssey, and the divine epics of Hesiod. The Iliad refers to the Trojan War and the Odyssey narrates the wanderings of Odysseus. Of equal value are Hesiod's poetic works (8th century BC) "Theogony" and "Works and Days". These works refer to the creation of the world, the succession of divine rulers, the origin of human drama and sacrificial rituals, as they were anchored in ancient thought. Myths are parts of the Homeric epics, poems of epic cycles, lyrical poems and tragedies of the 5th century BC. They are also preserved as writings during the Hellenistic era by writers of the time such as Plutarch and Pausanias. Since Greek mythology holds a wealth of stories and their narrative would go beyond the scope of this text, the origin of the world and gods is presented below. According to the ancient Greeks, in the beginning there was chaos and absolute nothingness: there was a dark space in the universe without earth, life and gods, in which the "primal elements" of life (earth, fire, air, water) were chaotically distributed. The elements joined together and soon formed a solid mass from which the earth emerged. From the earth arose the first goddess and primal mother of all gods: Gaia. To give life and ensure procreation, chaos created Eros (representative of the desire for love), Erebos (= the darkness) and Nyx (= black night). From the union of Erebos and Nyx, aither (= air and light) and hemera (= day) arose. Gaia begot Ouranos, the sky, Pontos, the sea, and Tartaros, the underworld. From the union with their son Ouranos, Okeanos and Tithys were given birth, from the union of whom the rivers and the Oceanids emerged. Many more children followed; just to name a few: the sun (Helios), the moon (Selene) and the dawn (Eos). An entire race of gods was created, joined by twelve titans, one-eyed beings, cyclops, and hundred-armed giants who wreaked havoc. The Titans founded the first dynasty of deities. This was followed by the repudiation of the first father of the Gods, Ouranos, off the throne by his son Kronos, the battle of the Titans and the battle of the giants. Finally, Kronos's son, Zeus, conquered Olympus and the dynasty of gods established itself in the third generation. The twelve main gods of the Greeks resided on Mount Olympus. The supreme and most powerful Olympic god and ruler of other gods is Zeus, son of the pair of Titans, Kronos and Rhea. Zeus’s wife and sister is Hera, guardian of marital sexuality and protective goddess of marriage and childbirth. The virgin goddess of the sacrificial fire and family as well as the hearth is Estia, also a sister of Zeus. The god of the sea is Poseidon, another brother of Zeus, who lives in the depths of the sea in a crystal palace. The goddess of fertility, earth and agriculture is Demeter, a sister of Zeus. She also has a daughter with Zeus, named Persephone. The god of war is Ares, a son of Hera and Zeus. Another son of Hera and Zeus is Hephaestus, the god of fire, volcanoes, blacksmithing and architecture. The goddess of hunting and the Moon is Artemis, daughter of the father of Gods and titan Leto and twin sister of Apollo. The god of poetry, healing, spring and light, and the fine arts, especially music, poetry and song, and god of archers is Apollo. The messenger of the gods and the god of thieves, trade and travelers is Hermes, son of Zeus and the nymph Maia. The goddess of wisdom, struggle, strategy, art and handicraft is Athena and at the same time the protective goddess of Athens. Athena is the daughter of Zeus and Metis, the first lover of the father of the Gods. The goddess of beauty, love and sensual desire is Aphrodite, wife of Hephaestus and, according to Homer, daughter of Zeus and Dioneor, according to Hesiod, daughter of Ouranos, one of the pre-Olympic gods.